The government of Tealangana had entered into an MOU with ISRO for establishing multi-channel Satellite network and using the KU-Band for promoting the use of Information Technology for the overall development of the state. It has been designated as TSAT. The Information Technology & Communications Department of the State Government has constituted TSAT (Society for Telangana Network) to undertake educational programmes production and Telecasting of Video lessons on behalf of all the wings of Education. In the Commissionerate of Collegiate Education, a separate wing called TSAT Cell is established to administer the programmes of the TSAT, content generation, correspondence and financial management of the budget allotted etc. A platform to explore the potentials of the teachers and students too. To help students in rural, backward and remote areas where there is shortage of faculty and infrastructure facilities. To impart counseling to the students for vertical & horizontal mobility. To train the students in Job oriented programmes through Certificate courses. To conduct Special live programmes and teleconferences with experts. 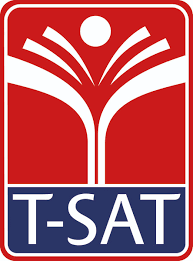 Telecast of TSAT lessons are through Channel I (Recorded lessons) and Channel II (Live and Interactive presentation) .Channel I of Collegiate Education has come into operation from 3.7.2001 and channel II from 3.10.2002. Now 165 Government Degree colleges and a few private aided colleges have the receiver sets. Channel I telecasts “Video Recorded Lessons” of under graduate subjects on topics where students need special emphasis for grasping the subject matter through visually oriented presentations. To telecast live lessons on important topics of under graduate subjects including restructured subjects like Bio Technology, Micro Biology and Computer Science etc. To conduct certificate course on “soft skills and Communication skills”. One In-charge is appointed as TSAT Coordinator who takes care of TSAT and the programmes telecasted by them from time to time. A separate TSAT is set with a seating capacity of 100. TSAT programme sheet is displayed on the notice board and the concerned subject teacher will be informed about the programmes who will take care of the students while watching the TSAT programme. After the programme a feedback is received from the students about the programme. The consolidated report on the programme will be sent to the Commissionerate of Collegiate Education by the programme coordinator.